According to Gary Regan in his book The Joy of Mixology, “This cocktail was created by Harry Craddock, for the Leap Year celebrations at the Savoy Hotel, London, on February 29th, 1928. It is said to have been responsible for more proposals than any other cocktail that has ever been mixed,” reports The Savoy Cocktail Book (1930). This recipe is adapted from Craddock’s original, but can certainly be enjoyed at any time of the year.” Or certainly today, February 29, 2004 at the time of this writing, 76 years to the day after Harry created it for us. 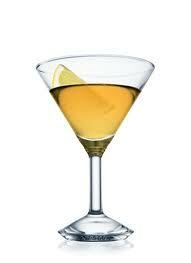 1 lemon twist, for garnish.Stir and strain into a chilled cocktail glass. Add the garnish.